Are you a blurker? Do you even know what a blurker is? A blurker is someone who reads a blog this blog, maybe smiles at a photo of my son, nods in agreement at something I’ve written, perhaps even admires a scrapbook page I’ve shared … but never, ever leaves a comment to say they stopped by. If so, then please break that habit and leave a comment to say why you read about the daily doings of my life. I’m not looking for compliments, although feel free to chuck in the odd one or two, I’m interested to know what makes my blog readable and perhaps how I can improve it. I LOVE your in-car entertainment system!! I AM one of your commenters…as I have just written in my own Blog, I like mixed -all-about-life blogs..just like yours! There are places I comment & places I blurk. Love to see what the life of a SAHM is like! I don't think I ever blurk with your blog! I try to comment on the blogs I watch via my own blog, but sometimes I click on new ones that I see in other people's sidebars, and then I may have to confess to a little bit of secret blurking! I'm a blurker. I regularly pop in to see what you're doing and admire your photos, layouts etc. Yours is one of my favourite blogs – and now you know I'm here. Not sure if I've commented before or not, but for the sake of today's post I wanted to make sure that I took the time to say HI!! I enjoy reading a little of everything and I like at least one photo in a blog post, too. I rarely blurk unless time is of the essence, then I scan all blogs and try to comment the next time around. 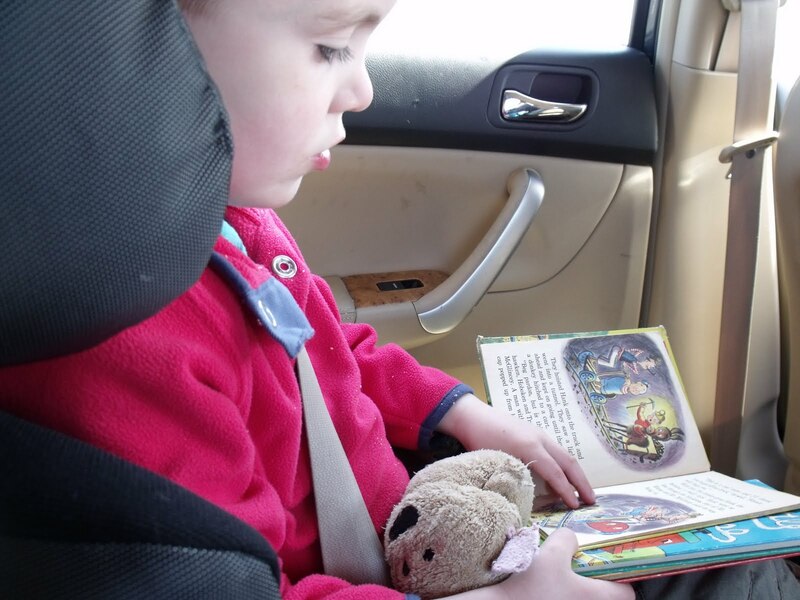 So happy to see the little one with books in the car!! I'm with Stacey on this one – rarely don't comment if I've been over here! I have not read the prompt yet – perhaps I should! Time to come out of the closet so to speak! I enjoy reading your blog – maybe because I know you – but it is lovely to see your DS grow up – cannot believe he is 4 already – where has the time gone? Hello – I used to be a “blurker” until I did shimelles bfs class now I try and comment when I can. I have been enjoying your blog since taking the class and its one of my favourites. Sometimes everyone else has said what I want to say, leaving me the boring old “me too”, which, incidentally, someone told me means “lady with a big nose” in Greek. I have no idea if it is true or not but thought it would make my comment a little different. I think blogger just ate my comment. That nearly made me a bkurker, which I'm not – unless my Google Reader is absolutely stuffed. But I do read every post. Wouldn't miss it. Since adding you to google reader, I have read all your posts. I comment when I have something to say and skip when I don't – which maybe gets you comments on half of your posts??? Not sure. Usually when I don't comment it is just because I'm too busy to really engage. Hello! I'm actually brand spankin' new to your blog and LOVE your term 'blurker'! 🙂 I am also in Shimelle's class as well as One Little Word. Consider yourself added to my feed reader. … um, speaking of which, I forgot to say that I like your low-tech approach to in-car entertainment. Rather like our “system” too! I think I'd like to read that book – it looks very nice. I'm a champion blurker… I rarely ever comment on the blogs I read. I forget how I found yours, but I liked it and have read it ever since. Your little guy is so cute! Hi Ruth. I am taking BB4S along with you, and I confess that I'm a blurker (and didn't even know there was a word for it). Thanks for sharing the amazing photo! Sorry, that's not me! I am a blogger. LOL! You know I leave comments. I'm a magpie. I can't help chattering.